The risks of reporting the truth in Egypt are clear, as shown by the prison sentences imposed this week on three journalists for Al Jazeera. A small piece of me thinks countries like Egypt have the right idea about freedom of the press. There isn't any. 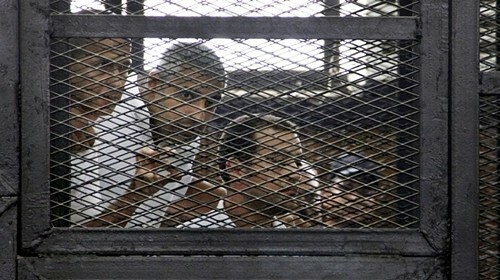 In Egypt, the powers that be didn't like Al Jazeera's reporting, so a judge just sentenced three of its journalists to seven years or more in prison. I suspect international opinion matters in Cairo, but the government's first reaction to the denunciations that rolled in from the White House and other parts was a statement asserting its "complete rejection of any foreign interference in the country's internal affairs." If you're a reporter in Egypt you know where you stand. If the truth is all that matters to you, you'll tell it and take your chances. If you're tempted to lick the hand that can either feed or muzzle you, you'll lick it, and everyone will know you've licked it. Here in the U.S. the press is either speaking truth to power or lobbying power to pass shield laws or sharing drinks and belly laughs with power in lavish banquet halls in Washington. It's not so clear where anyone stands. Tyranny keeps it simple. I'm reminded of the summit meeting in West Side Story where the rumble is planned. Bernardo: "Let’s get down to business." Riff: "Bernardo hasn’t learned the procedures of gracious living." Bernardo: "I don’t like you either, so cut it." Riff and Bernardo don't know much about gracious living, but they know how phony it is. But the thing about liberty, democracy, and freedom of speech is that phoniness greases all these wheels. Even if we don't actually feel that what unites us is greater than what divides us, we tell ourselves it is. We're not going to remain the greatest country on earth unless we hold supreme certain values that we personally don't have much patience for at all. So in America, the powers that be and journalists go along with the pretense that they're not separated by anything fundamental. Countries like Egypt don't kid themselves. The fate of the Al Jazeera journalists punched a hole in my heart, but there's something to be said for clarity. I've been reading the Doris Kearns Goodwin book The Bully Pulpit, about the turn-of-the-last-century presidents Roosevelt and Taft, McClure's magazine, and the Progressive era. McClure's reporters like Lincoln Steffens and Ida Tarbell were scourges of the trusts and urban machines that had cornered and were abusing far too much power for any healthy society to tolerate; the problem, which they weren't blind to, was that their muckraking explicitly served President Roosevelt's interests—Roosevelt even consulted with them and wrote them fan letters. Reform depended on the press and the White House—in cahoots. But in cahoots is where a free and professional press is never supposed to be found. How free—or at least, how honorable—is a free press that makes opportunistic alliances? If you worked for Al Jazeera in Cairo and are now in prison you obviously didn't make one of those, and maybe that's why I feel a sliver of envy for the prisoners: outlaw status is the gateway to supreme righteousness, the righteousness of the martyr. Life in the American press corps offers lots of benefits, but that isn't one.